Nowadays, Any UFO sighting lacks practically of importance, especially if we consider that extraterrestrial beings share this planet with us ever since the Roswell incident and the construction of Area 51. Unfortunately, in this case the worst human beings are combined with the worst extraterrestrial beings. How is it possible that they can keep the extraterrestrial presence hidden from the public? Well, perhaps ufologists are those that have more responsibility. Who can take them seriously if they hunt UFOS as if they were children chasing butterflies? As for the UFO Phenomenon and the sightings in Mexico, the Department of Defense acknowledged the presence of these ships, but once again “the secret protects itself”. Interlocutor: Today I have a lot of questions to ask you, could we start with the questions right away? Ruanel: Okay, you may ask. 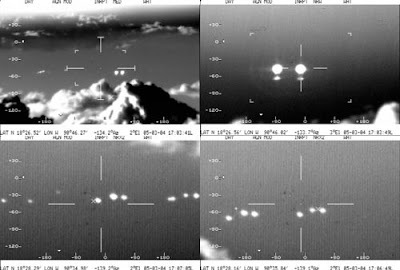 Interlocutor: I’d title the topic as “UFO sightings in Mexico" Well, the Mexican Air force released to the public video footages of UFOs that were recorded by a military airplane. In this video it’s possible to see 11 lights that surround the airplane, they accompany it for a while and then they go away. Well, this is what I could find related to the incident in Mexico. Are these lights extraterrestrial ships? Ruanel: That’s right, and not only the pilots have seen them but also a lot of Mexican people. Interlocutor: Were they really 11 ships? Ruanel: The number is correct because each light corresponded to each ship. Interlocutor: Did they come for something special, for example to make their presence known? Ruanel: No, not at all, they simply came to explore. Interlocutor: And to abduct some people? Ruanel: No, not with that purpose. Ruanel: From Spica, more precisely from Spica IV. Interlocutor: From Spica IV, Aren’t they those we call "Bedroom visitors”? Ruanel: The fact is correct. They came before already. Ruanel: They have come only in a study mission. Interlocutor: I’m intrigued for the reason that they let people see them. Ruanel: They didn’t let people see them, they simply didn't care whether they see them or not. Interlocutor: I don’t understand well why they didn't care?. Ruanel: Because they know about the skepticism of some official centers that have seen them - and in spite of being prepared to detect extraterrestrial ships in the area since they are qualified people on the matter, a week later, they already forget the topic. It will only be recorded by ufologists. Interlocutor: How long do their ships take to arrive to the Earth from Spica IV? One month or two? Ruanel: How one month or two? Only Hours nothing more! Interlocutor: It is truly incredible! At this time how many ships are there? Ruanel: At least there are 6 ships. Interlocutor: Do they have also a mother ship? Ruanel: No, they have only small ships. The mother ships are in the satellites of Uranus. Interlocutor: How many mother ships do they have? Interlocutor: And why do they have them so far? Ruanel: It’s far for the terrestrial technology, but not for them. They travel through the Solar System from one extreme to another in minutes. Interlocutor: Well, sometimes I forget that we are speaking of extraterrestrial technology and I only think in terms of terrestrial technology. Do these aliens have some establishment on Earth? Ruanel: No, they don't have any base, they stay orbiting. Interlocutor: Without any problem at all? Ruanel: Their technology allows them to do so easily. Interlocutor: What size do the small ships have? Ruanel: About 30 or 35 meters. Interlocutor: How many crew members transport each ship? Ruanel: Around 20 to 25 members. Ruanel: Most of them are male. Interlocutor: Concretely, what are they doing in these moments? Ruanel: They travel to Earth with teleporting machines and they pick up samples of minerals, plants and small animals, like insects in order to study them. Ruanel: No, in this occasion they didn’t abduct humans. They are in another type of mission different from abductions. Interlocutor: I understand. Are the aliens from Spica IV that abduct people still here? Ruanel: No, in these moments there is none. Interlocutor: A question that I was forgetting is: Why the Secretary of Mexican Defense gave the video footage to Jaime Maussan, precisely an ufologist? I know that the military personnel are skeptical on this matter. Ruanel: They gave it to him because ufologists have little credit and they considered that it was the best way to discredit the whole sighting. Interlocutor: I can only laugh at something so elementary. Is Jaime Maussan from a similar category like Fabio Zerpa? Ruanel: Yes, he is similar. Interlocutor: Are you saying that ufologists only know a little from the UFO phenomenon, but they don’t know anything of the truth behind UFOs? Ruanel: Correct, but all the ufologists are like that, not only them. Interlocutor: Are they silly maybe? Ruanel: No, they are simply limited people. If they were not limited, they would be devoted to more useful things. Interlocutor: I understand. Does Jaime Maussan know something related to the aliens that abduct, experiment and kill the women in Juarez? Interlocutor: In spite that I told him about it? Ruanel: He takes it as another piece of information more. Interlocutor: I’m surprised for the shortsightedness of some human beings, especially those who should know the truth due to their profession. Well, I believe that this topic is over. Interlocutor: Master, there is a person who asked me if a dimensional door exist in the area called “Cerro de las Ollas” in Mexico that has originated the urban legend of the missing shepherd with his dog. It seems that every June 24, a kind of town appears on this hill and it is said that if one ends up seeing it and passes through it, he or she can disappears forever. UFOs have also been seen in this area. It is said that in 1971 a UFO crashed in the community of Ixtacamaxtitlan, Puebla, Mexico, but this person says that he along with his siblings went to that place of the collision, but some soldiers apparently Americans did not allow them to go to that place. What is the true about this case? Ruanel: First let’s talk about that dimensional door. It is true that there is a natural dimensional door, but it is not true that people appear or disappear or that the door appears once in a while, those stories are fantasies. Interlocutor: But is the dimensional door static or it appears and disappears? Ruanel: It appears and disappears but not in a certain date. That is mythological. Interlocutor: Does the shepherd and his dog disappeared over there? Ruanel: Yes, but not in a certain date and one cannot enter through the portal that appears, No. Interlocutor: Okay. Is that door used by UFOs? Ruanel: No. because it is not as big so that a ship can pass through it. Interlocutor: Okay. Did many people disappear through that door? Ruanel: Accidentally yes, in different times. Interlocutor: In different times. Now, is there some city that could be seen or is that a fable? Ruanel: No. That is part of the mythological thing. That is a human fantasy. Interlocutor: Okay. What about UFOs? Do UFOs land on that place or not? Ruanel: No. they don’t descend, it’s true that a UFO crashed in that place and it is true that a command of the country of the North didn't allow people to come closer. Yes, that is true. Interlocutor: Was it a mother ship? Ruanel: No, but it was not a two-seater ship either, it was a ship that brought eighteen crew members. Interlocutor: Eighteen members. Where did they come from? Ruanel: They came from a stellar system located approximately at 180 light years from our solar system. Interlocutor: Okay. What race were they? Ruanel: They were of a similar race to the homo sapiens. Interlocutor: And where are those bodies? Are they at Area 51? Ruanel: No, the ship crashed and it was fixed, it was not taken by the country of the North. Interlocutor: But those soldiers... Did they stay in there until the ship was fixed? Interlocutor: Was there a contact with those soldiers? Ruanel: No, the extraterrestrials didn't allow that they came closer, they put an energy field and they didn't allow them to come closer. Interlocutor: So they worked calmly and they repaired the ship and then they left. Ruanel: Yes, but they stayed a short time, it was only three days, no more than that. Interlocutor: I don’t know if you said the name of their planet. Ruanel: No, I didn't say it; their planet is called Andor 3. It’s a yellow star 1.2 times the size of the Sun. Interlocutor: Okay. Did they come in a mother ship or they came only with that ship? Ruanel: No, They came in a bigger ship. Interlocutor: And why did they come? Ruanel: They always come in investigation tasks. Interlocutor: In this case nothing to do with tourism. Interlocutor: Okay. So the Americans were left hanging! Ruanel: They were left hanging, but they have taken hundreds of pictures. Interlocutor: Ah! They could take pictures of the ship? Interlocutor: And also pictures of the extraterrestrials that were working and everything? Ruanel: No, because the aliens have worked inside the ship. Interlocutor: Well. About this, Is there another mystery to be solved? Ruanel: No, but we can say that the country of the North has infinity of photographic evidence, videotapes, films and a lot of things more without mentioning Area 51. This entry was posted at Friday, April 23, 2010 and is filed under Extraterrestrials . You can follow any responses to this entry through the .